The colour of rust sits comfortably in the natural environment – like green’s complement red, blended with dabs of earth and bark. As with the orb above, even a smooth surface weathers into delicious textural variations. Rust hints of history and age, so that adding a rusty bit helps a new garden feel established. If you squint, you can see some poetry about decay and the cycle of life. Can’t you? 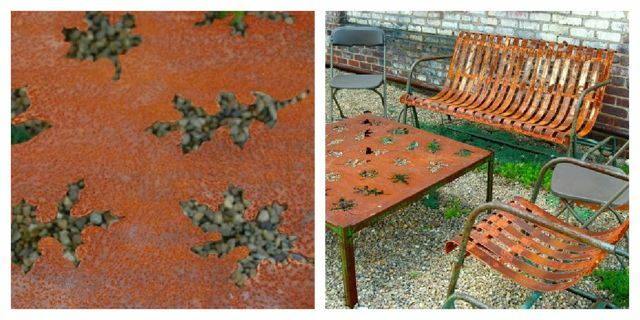 Corten Steel – the corrosion-resistant metal – is the rusty sheeting you’ve probably seen in gardens lately, as planters or edging. We hope you’ll find this other rusty stuff we’ve admired inspiring. Tell us what you think afterwards: Rust, or bust? 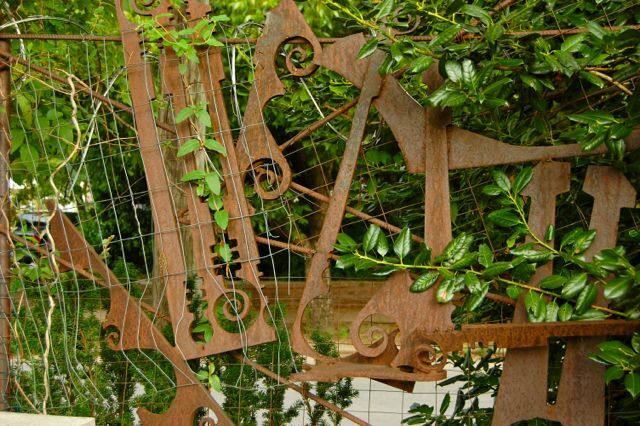 Rusty off-cuts turn a fence into artwork in Robert Bellamy‘s Dallas garden. See more of this artful space here. 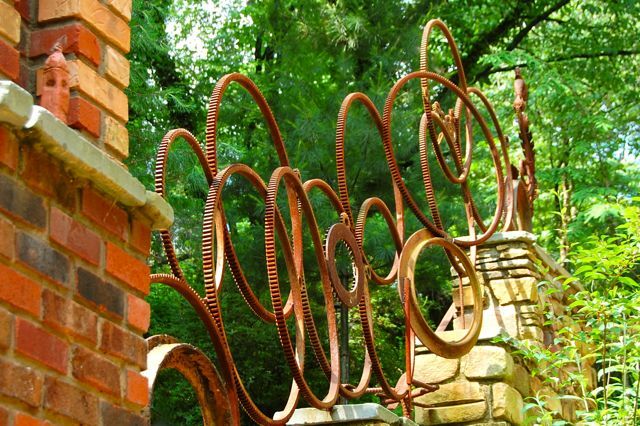 We showed glimpses of Ricki Pierce’s amazing cog railing in our post on Wamboldtopia. Here’s a fuller view. Rusty stuff doesn’t have to be funky. 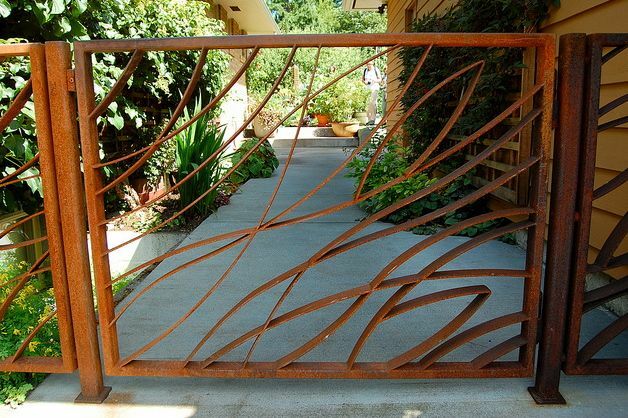 This rather elegant gate is from the Seattle garden of Jim and Suzette Birrell. 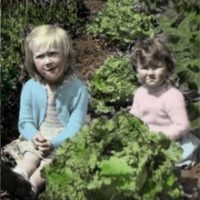 I love rust, and you have given us some really beautiful examples! I think you said it perfectly in that rust just sits comfortably in the natural environment-not on my clothes though when I sit on rusty benches. Love the rust! 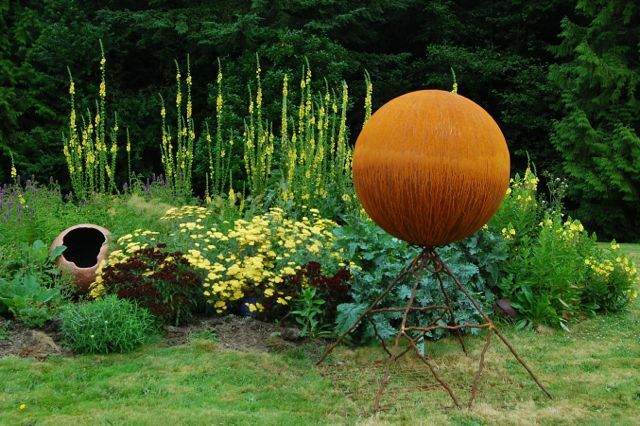 Without trying, over the years I have collected many garden ornaments all of which are rusting beautifully- favourites are a dragonfly and a really large sunflower. Like Tina I wouldn't want to sit on the rusty furniture! Just found your blog. Keep going, it is great. Rust for sure! I shocked more than a few people by leaving a recently purchased piece of heron statuary outside in the winter elements in the hope that it would do just that…. rust. 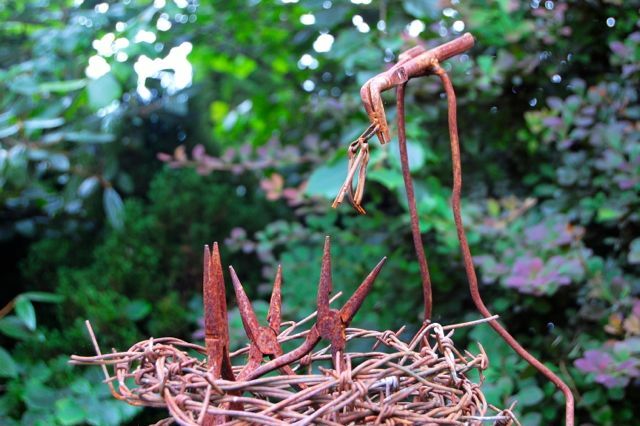 There is something magical about its presence [rust] in the garden. Love the bird's nest!! 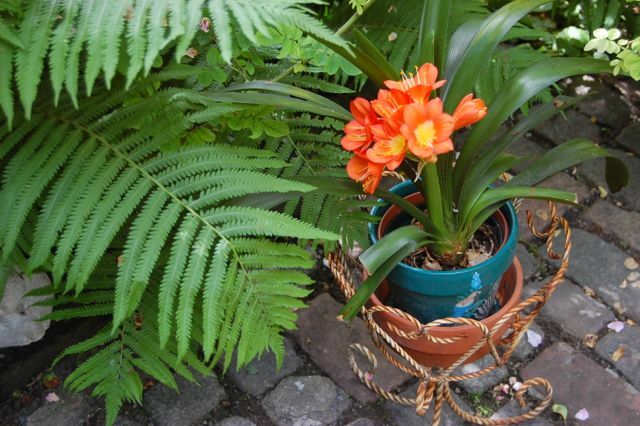 Funny that you share a Clivia today. Mine is about to bloom, so I brought it upstairs to the living area. While standing at the front door waiting for the dog to come back in, I pulled off a yellowing leaf….and a swarm of little black ants came up out of the soil. Sadly it is in the garage now. I thought I had taken care of all the insects on houseplants that had been outside….apparently I missed one.